The United Nations Rapporteur on minority issues today recommended the government establish a fully empowered independent commission for minority issues is included in constitutional reforms to implement mandates and foster relations between communities. Concluding her ten day visit Rita Izsak- Ndiaye the UN’s Rapporteur on Minority Issues urged the government to seize the momentum that still exists from its election, to establish a well coordinated reconciliation and accountability process. Izsak- Ndiaye said an in-depth report on her consultations will be submitted to the United Nations in 2017 but released a statement with shirt term and long term recommendations to the government. Stressing the need to implement the short term recommendations Izsak- Ndiaye said issues relating to the return of land, political detainees and military powers were short term solutions for the government’s commitment towards reconciliation. As short-term recommendations in this regard, in which the visiting UN Rapporteur wanted to be implemented as soon as possible are to; begin taking necessary steps towards the establishment of an independent, dedicated minority rights mechanism in charge of coordinating minority issues, with the inclusion of representatives of minority communities. -Ensure that the imminent constitutional reform includes a strong minority rights regime including a fully empowered independent commission. -Extend full institutional cooperation to, and strengthen the existing independent intuitions and ensure sufficient human and financial resources are provided for the full implementation of their mandates, including the National Human Rights Commission, the Office for National Unity and Reconciliation and the Secretariat for Coordinating Reconciliation Mechanism. 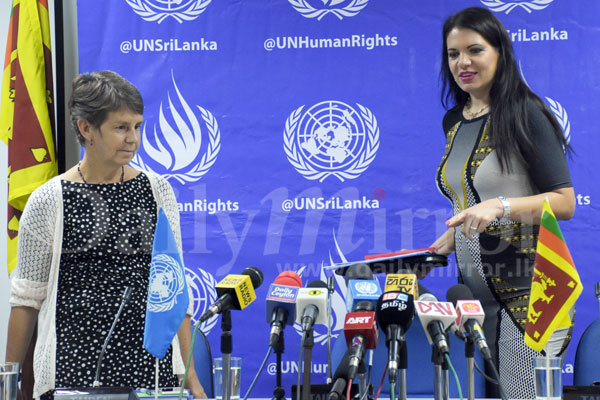 Among her short term recommendations for Sri Lanka, the Rapporteur stated that even though the Prevention of Terrorism Act has been repealed its replacement needed to conform with international standards. Regarding political detainees, the Izsak- Ndiaye recommended that all cases connected to security-related detainees be reviewed and the government take measures to either release the detainees who could not be prosecuted or draw up chargers against those whom there was evidence of involvement in serious crimes. Finally, Izsak- Ndiaye stressed that the continued and gradual release or compensation for land under military control to the civilian population was vital in the reconciliation process. While the government was commended for taking steps towards inclusive public participation in the decision making process, more needed to be done for the voices of minority communities to be heard. The public condemnation of religious intolerance, holding perpetrators of hate crimes and violence accountable and considering the establishment of a system of community liaison officers, to be placed in every public institution, with the necessary resources required to fulfill their mandate. Izsak- Ndiaye further recommended the government step up measures and allocate a sufficient budget to ensure the implementation of language policy and also ensure that any future electoral reform ensures proportional representation for all minority groups on the basis of accurate data collection and disaggregation. Until to date I really have't heard any minority issue other than the only demand for a separate state within Sri Lanka borders by Sri Lankan Tamil. SHE READ A SPEECH TNA WROTE FOR HER. UN representative have visited wrong country and reading wrong report.